For me this is truly scary, how anyone can deny global warming in the face of this is beyond me, is this summer going to be the new normal? I read that there is big concern in Spain for the weekend with breezy conditions at times adding to the fire risk. Hopefully no repeat of what happened in Greece recently. Got up to 44.6C in Alvega , Portugal today. 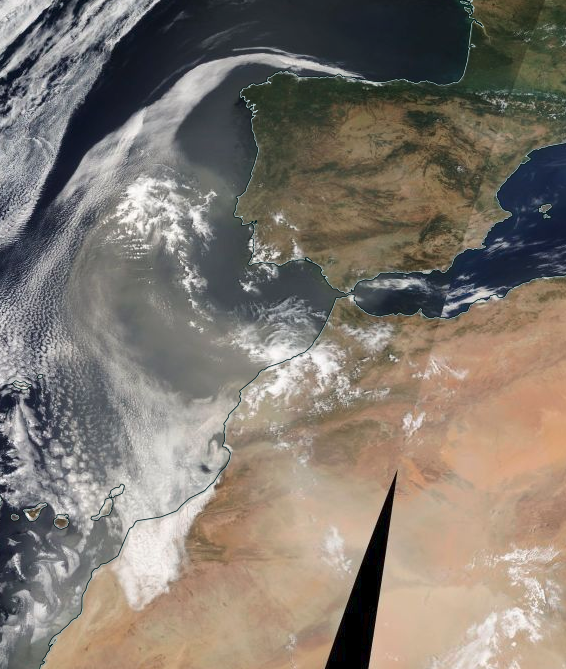 Along with the heat coming up off Africa, Spain Portugal getting a lot of Saharan dust as well. Some heat. I would be jumping on a plane home I think. Last edited by Meteorite58; 02-08-2018 at 21:04. The Portuguese Met have a statement on their website correcting the 50-degree max temperature forecasts automatically generated by their model on their website and app. Good to see this sort of thing being published. Could be some epic lake effect snow downwind from the Baltic Sea later in the autumn and into early winter, of the SSTs are slow to drop. Small tornado at the end of a music festival in Germany. Robert, LSD has strange effects. 42c (rounded) reported on the 14:30 METAR in Lisbon airport. The all time record is 42c, so looks like it could be beaten. 43c reported at 3pm, so the record has been broken.